Fight Entropy: Was there a trend break when Noah built his Ark? Was there a trend break when Noah built his Ark? I just sifted through a 700-entry bibliography, and this was the coolest paper I found (2008, PNAS). It definitely wins the FE-paper-find-of-the-month award. I don't have the patience to carefully track population changes in rodent communities for 30 years (! ), but I'm really excited to see the results when someone else does. Abstract: Extreme climatic events are predicted to increase in frequency and magnitude, but their ecological impacts are poorly understood. Such events are large, infrequent, stochastic perturbations that can change the outcome of entrained ecological processes. Here we show how an extreme flood event affected a desert rodent community that has been monitored for 30 years. 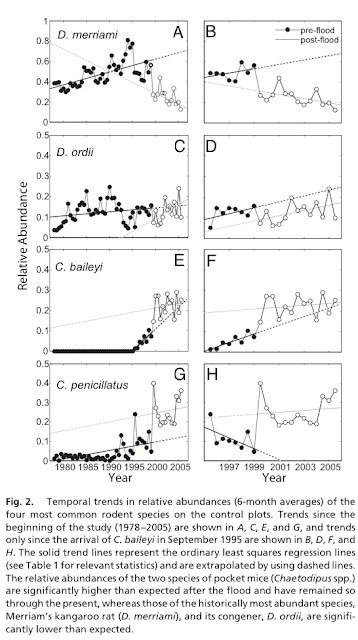 The flood (i) caused catastrophic, species-specific mortality; (ii) eliminated the incumbency advantage of previously dominant species; (iii) reset long-term population and community trends; (iv) interacted with competitive and metapopulation dynamics; and (v) resulted in rapid, wholesale reorganization of the community. This and a previous extreme rainfall event were punctuational perturbations—they caused large, rapid population- and community-level changes that were superimposed on a background of more gradual trends driven by climate and vegetation change. Captured by chance through long-term monitoring, the impacts of such large, infrequent events provide unique insights into the processes that structure ecological communities. Capital with a capital "C"
How much groundwater does Africa have?